Kamille A. West, M.D., Marguerite L. Barrett, M.S., Brian J. Moore, Ph.D., Jeffery L. Miller, M.D., and Claudia A. Steiner, M.D., M.P.H. Blood transfusion is a medical procedure to supply blood and blood components to a patient through an intravenous line in order to replace blood lost during surgery or injury, or when the body cannot make blood properly because of illness.1 In modern practice, blood is separated into components to meet the specific needs of the patient. Red blood cells are the most commonly transfused blood component. This Healthcare Cost and Utilization Project (HCUP) Statistical Brief presents national data on hospital inpatient stays among adults with a red blood cell transfusion from 2000 to 2013. The analyses focus on stays with any red blood cell transfusion, rather than on the number of blood units transfused. We present trends in stays with a red blood cell transfusion relative to the trend in all inpatient stays from 2000 to 2013 as well as an overview of characteristics of stays with a red blood cell transfusion. We also present trends in the percentage of stays with a red blood cell transfusion by age. We then focus on 2013 and present the most frequent diagnoses for stays with a red blood cell transfusion. In addition, we examine the most commonly performed procedures that occur among patients receiving a red blood cell transfusion. All differences noted in the text differ by at least 10 percent. Figure 1 presents the total number of adult inpatient stays and the number of stays with a red blood cell transfusion from 2000 through 2013. Hospital inpatient stays with a red blood cell transfusion increased 85.8 percent from 2000 to 2013, a trend that was not driven solely by increases in the total number of inpatient stays. The percentage of all inpatient stays with a red blood cell transfusion also nearly doubled from 2000 to 2013 (80.6 percent increase). For all age groups, the percentage of adult inpatient stays with a red blood cell transfusion increased from 2000 to 2013. In 2013, nearly 10 percent of all stays for patients aged 65 years and older included a red blood cell transfusion. Septicemia was the most frequent principal condition for stays with a red blood cell transfusion in 2013, followed by gastrointestinal hemorrhage. Approximately 40 percent of hospital inpatient stays with a red blood cell transfusion also included a major therapeutic procedure. Treatment of a hip fracture or dislocation was the most frequent major procedure category with a red blood cell transfusion in 2013, followed by hip and knee replacement. Approximately 34 percent of hospital inpatient stays with a red blood cell transfusion included a minor, but no major, therapeutic procedure. Respiratory intubation and mechanical ventilation was the most frequent minor procedure category with a red blood cell transfusion in 2013, followed by hemodialysis. Line graph showing the number of all inpatient adult hospital inpatient stays and those with a red blood cell transfusion. All inpatient stays: 2000, 29,126,053; 2001, 29,920,995; 2002, 30,268,725; 2003, 30,676,256; 2004, 30,966,846; 2005, 30,978,228; 2006, 31,628,376; 2007, 31,551,163; 2008, 32,060,332; 2009, 31,647,642; 2010, 31,318,051; 2011, 31,472,521; 2012, 30,712,524; 2013, 29,969,451, for a cumulative increase of 2.9%. Stays with a red blood cell transfusion: 2000, 1,141,495; 2001, 1,386,036; 2002, 1,422,962; 2003, 1,635,534; 2004, 1,815,566; 2005, 1,919,872; 2006, 1,961,628; 2007, 2,168,151; 2008, 2,242,831; 2009, 2,344,304; 2010, 2,302,865; 2011, 2,445,549; 2012, 2,275,330; 2013, 2,120,739, for a cumulative increase of 85.8%. The number of hospital inpatient stays with a red blood cell transfusion increased 85.8 percent from 2000 to 2013, substantially higher than the rate of increase for all inpatient stays. The number of hospital inpatient stays with a red blood cell transfusion procedure among patients aged 18 years and older increased 114.2 percent between 2000 and 2011, followed by a 13.3 percent decrease between 2011 and 2013. The cumulative increase from 2000 to 2013 was 85.8 percent. The total number of hospital inpatient stays among patients aged 18 years and older also increased between 2000 and 2013 (following a somewhat similar pattern of increasing and then decreasing). However, the cumulative increase in all stays was only 2.9 percent across the 13-year period. Table 1 presents patient and hospital stay characteristics for inpatient hospitalizations with a red blood cell transfusion in 2000 and 2013.
a Hospital costs in 2000 are inflation adjusted and expressed in 2013 dollars. Both the number and percentage of all inpatient stays with a red blood cell transfusion nearly doubled from 2000 to 2013. The number of stays with a red blood cell transfusion procedure increased from approximately 1.1 million in 2000 to 2.1 million in 2013. Stays with a red blood cell transfusion as a percentage of total inpatient stays increased from 3.9 percent in 2000 to 7.1 percent in 2013. Women and patients aged 65 years and older represented the highest proportion of stays with a red blood cell transfusion in both 2000 and 2013. Females represented a higher proportion of inpatient stays with a red blood cell transfusion in both 2000 (58.0 percent) and 2013 (57.2 percent). Patients aged 65 years and older represented around 60 percent of stays with a red blood cell transfusion in 2000 and 2013. Patients aged 45-64 years increased as a percentage of stays with a red blood cell transfusion, from 22.9 percent in 2000 to 28.5 percent in 2013. The rate of inpatient stays with a red blood cell transfusion was higher in the South and the Northeast than in other regions of the country in 2000 and 2013. The rate of stays with a red blood cell transfusion was highest in the South and Northeast in 2000, at 661.4 and 639.8 stays per 100,000 adults, respectively. The rate of inpatient stays with a red blood cell transfusion increased from 2000 to 2013 in all regions. In 2013, the regions with the highest rate of stays with a red blood cell transfusion were still the South and Northeast, with rates of 1,005.6 and 939.8 stays per 100,000 adults, respectively. The largest cumulative increase in the rate of stays with a red blood cell transfusion between 2000 and 2013 was in the Midwest, where the rate more than doubled (a 138.6 percent increase). The proportion of hospital inpatient stays with a red blood cell transfusion that were admitted through the emergency department increased over 20 percent from 2000 to 2013. Stays with a red blood cell transfusion had a mean length of stay greater than 8 days in both years. In 2000, 51.9 percent of hospital inpatient stays with a red blood cell transfusion were admitted through the emergency department compared with 63.3 percent in 2013, representing a 22.0 percent increase. Stays with a red blood cell transfusion had a mean length of stay of 8.9 and 8.3 days in 2000 and 2013, respectively. By comparison, the mean length of stay among all adult hospital inpatient stays was just 4.9 days in 2000 and 4.7 days in 2013 (data not shown). Despite the decrease in length of stay during this time period, inflation-adjusted mean hospital costs for hospital stays with a red blood cell transfusion increased 22.6 percent from 2000 to 2013, from $19,000 to $23,300. Figure 2 presents the distribution of hospital inpatient stays with a red blood cell transfusion, with another procedure but no red blood cell transfusion, or with no procedure in 2000 and 2013. Stacked bar chart showing the percentage of inpatient stays by procedure type for 2000 and 2013. No procedure: 2000, 36.7%; 2013, 35.5%—a 3.4% decrease. 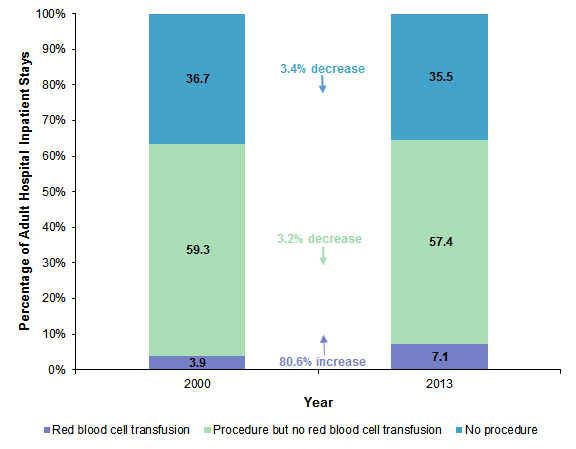 Procedure but no red blood cell transfusion: 2000, 59.3%; 2013, 57.4%—a 3.2% decrease. Red blood cell transfusion: 2000, 3.9%; 2013, 7.1%—an 80.6% increase. The proportion of hospital inpatient stays with a red blood cell transfusion increased 80.6 percent from 2000 to 2013. Stays with a red blood cell transfusion increased from 3.9 percent to 7.1 percent of all hospital inpatient stays between 2000 and 2013, an 80.6 percent increase. However, fewer than 10 percent of inpatient stays involved a red blood cell transfusion in either year. Inpatient stays with a procedure (either surgical or nonsurgical) without a red blood cell transfusion represented the greatest proportion of all inpatient stays, 57.4 percent in 2013. Stays without any procedure represented 35.5 percent of all inpatient stays in 2013. 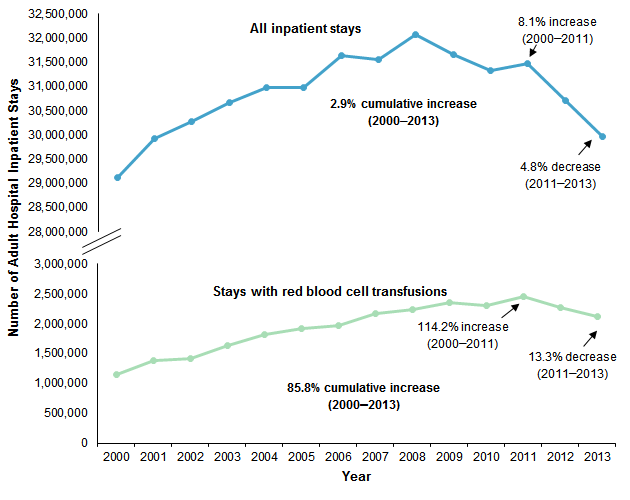 Figure 3 presents trends in stays with a red blood cell transfusion as a percentage of total hospital inpatient stays, by patient age, from 2000 through 2013. Line drawing showing the percentage of adult inpatient hospitalizations with a red blood cell transfusion by age, 2000-2012. Ages 18-44 years: 2000, 1.5; 2001, 1.8; 2002, 1.8; 2003, 2.1; 2004, 2.3; 2005, 2.4; 2006, 2.4; 2007, 2.7; 2008, 2.8; 2009, 3.1; 2010, 3.2; 2011, 3.3; 2012, 3.2; 2013, 3.2. Ages 45-64 years: 2000, 3.6; 2001, 4.4; 2002, 4.3; 2003, 5.0; 2004, 5.6; 2005, 5.9; 2006, 5.9; 2007, 6.7; 2008, 6.8; 2009, 7.2; 2010, 7.2; 2011, 7.6; 2012, 7.2; 2013, 6.9. Ages 65+ years: 2000, 5.9; 2001, 6.9; 2002, 7.1; 2003, 8.0; 2004, 8.9; 2005, 9.2; 2006, 9.3; 2007, 10.3; 2008, 10.2; 2009, 10.8; 2010, 10.5; 2011, 10.9; 2012, 10.5; 2013, 9.9. The increase in the percentage of adult inpatient stays with a red blood cell transfusion from 2000 to 2013 occurred across all age groups. In 2013, nearly 10 percent of all stays for patients aged 65 years and older involved a red blood cell transfusion. Stays with a red blood cell transfusion as a percentage of all inpatient stays grew from 2000 through 2013 across all adult age groups. The percentage of stays with a red blood cell transfusion among patients aged 18-44 years grew 108.1 percent from 2000 to 2013, from 1.5 percent to 3.2 percent of all stays. The percentage of stays with a red blood cell transfusion among patients aged 45-64 years grew 89.0 percent, from 3.6 percent to 6.9 percent of all stays. The percentage of stays with a red blood cell transfusion among patients aged 65 years and older grew 67.1 percent, from 5.9 percent to 9.9 percent of all stays. Table 2 lists the 15 most frequent principal diagnoses among hospitalizations with a red blood cell transfusion in 2013. Data on the same diagnoses also are provided for 2000 for comparison. Note: Table is sorted by the highest number of stays with a red blood cell transfusion in 2013. Septicemia was the most frequent principal diagnosis for stays with a red blood cell transfusion in 2013, followed by gastrointestinal hemorrhage and hereditary, nutritional, hemolytic, and bone marrow failure anemias. Septicemia was the principal diagnosis for 174,740 stays with a red blood cell transfusion in 2013, up from 28,603 stays with a red blood cell transfusion in 2000. The increase in septicemia stays with a red blood cell transfusion is due to both a four-fold increase in the total number of septicemia stays from 2000 to 2013 (from 308,638 to 1,276,805 stays) and an increase in the percentage of septicemia stays with a red blood cell transfusion over the 13-year period (from 9.3 to 13.7 percent). Gastrointestinal hemorrhage was the principal diagnosis for 171,995 stays with a red blood cell transfusion in 2013, and 141,225 stays for hereditary, nutritional, hemolytic, and bone marrow failure anemias involved a red blood cell transfusion. Among the top 15 conditions with a red blood cell transfusion in 2013, only stays for gastrointestinal hemorrhage had over 100,000 stays with a red blood cell transfusion in 2000. Diagnoses such as hip fracture, complications of device or surgery, and coronary atherosclerosis had large increases in the percentage of stays with a red blood cell transfusion from 2000 to 2013. The percentage of all hip fracture stays with a red blood cell transfusion increased from 19.5 percent in 2000 to 29.1 percent in 2013. The percentage of all complication of device, implant or graft stays with a red blood cell transfusion increased from 6.9 percent in 2000 to 13.4 percent in 2013. The percentage of all complication of surgical procedure or medical care stays with a red blood cell transfusion increased from 5.6 percent in 2000 to 11.7 percent in 2013. The percentage of all coronary atherosclerosis stays with a red blood cell transfusion increased from 3.0 percent in 2000 to 7.1 percent in 2013, although the number of stays with a diagnosis of coronary atherosclerosis decreased from 1,316,200 in 2000 to 458,295 in 2013. The number of osteoarthritis and renal failure stays with a red blood cell transfusion increased because of a large increase in the total number of stays for these conditions from 2000 to 2013. The number of osteoarthritis stays with a red blood cell transfusion increased from 36,177 in 2000 to 79,410 in 2013. This increase in osteoarthritis stays with a red blood cell transfusion resulted from an increase in the total number of osteoarthritis stays during this time period (430,281 to 1,022,945). The number of acute and unspecified renal failure stays with a red blood cell transfusion increased from 13,695 in 2000 to 54,830 in 2013, because of an increase in the total number of renal failure stays (121,451 to 495,000) with no change in the percentage of stays with a red blood cell transfusion. Figure 4 presents the distribution of stays with a red blood cell transfusion occurring with and without another procedure performed. For stays during which another procedure occurred, the procedures are categorized into three broad categories—major therapeutic, minor therapeutic, and diagnostic. 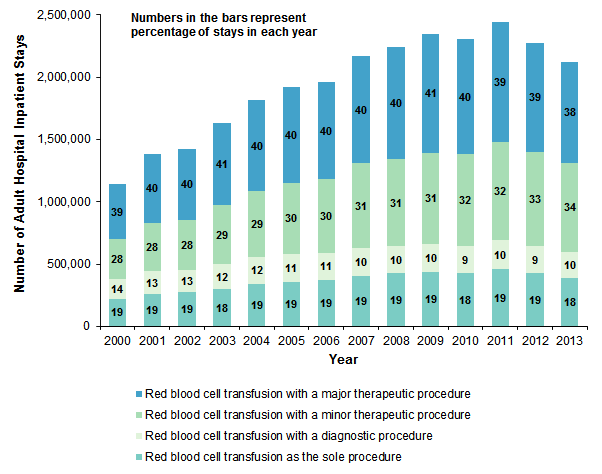 Stacked bar chart showing percentage of stays each year by type of red blood cell transfusion procedure, 2000-2013. 2000: with a major therapeutic procedure, 39; with a minor therapeutic procedure, 28; with a diagnostic procedure, 14; as the sole procedure, 19. 2001: with a major therapeutic procedure, 40; with a minor therapeutic procedure, 28; with a diagnostic procedure, 13; as the sole procedure, 19. 2002: with a major therapeutic procedure, 40; with a minor therapeutic procedure, 28; with a diagnostic procedure, 13; as the sole procedure, 19. 2003: with a major therapeutic procedure, 41; with a minor therapeutic procedure, 29; with a diagnostic procedure, 12; as the sole procedure, 18. 2004: with a major therapeutic procedure, 40; with a minor therapeutic procedure, 29; with a diagnostic procedure, 12; as the sole procedure, 19. 2005: with a major therapeutic procedure, 40; with a minor therapeutic procedure, 30; with a diagnostic procedure, 11; as the sole procedure, 19. 2006: with a major therapeutic procedure, 40; with a minor therapeutic procedure, 30; with a diagnostic procedure, 11; as the sole procedure, 19. 2007: with a major therapeutic procedure, 40; with a minor therapeutic procedure, 31; with a diagnostic procedure, 10; as the sole procedure, 19. 2008: with a major therapeutic procedure, 40; with a minor therapeutic procedure, 31; with a diagnostic procedure, 10; as the sole procedure, 19. 2009: with a major therapeutic procedure, 41; with a minor therapeutic procedure, 31; with a diagnostic procedure, 10; as the sole procedure, 19. 2010: with a major therapeutic procedure, 40; with a minor therapeutic procedure, 32; with a diagnostic procedure, 9; as the sole procedure, 18. 2011: with a major therapeutic procedure, 39; with a minor therapeutic procedure, 32; with a diagnostic procedure, 10; as the sole procedure, 19. 2012: with a major therapeutic procedure, 39; with a minor therapeutic procedure, 33; with a diagnostic procedure, 9; as the sole procedure, 19. 2013: with a major therapeutic procedure, 38; with a minor therapeutic procedure, 34; with a diagnostic procedure, 10; as the sole procedure, 18. From 2000 to 2013, approximately 40 percent of hospital inpatient stays with a red blood cell transfusion also included a major therapeutic procedure. The percentage of stays with a major therapeutic procedure among stays with a red blood cell transfusion was fairly constant from 2000 to 2013, representing approximately 40 percent of all stays with a red blood cell transfusion. Medical transfusions (red blood cell transfusions as the sole procedure) were also fairly constant across time, representing approximately 19 percent of stays with a red blood cell transfusion. Among inpatient stays with a red blood cell transfusion, the proportion with a minor therapeutic procedure increased, whereas the proportion with only a diagnostic procedure decreased over time. The percentage of red blood cell transfusion stays with a minor therapeutic procedure in addition to a red blood cell transfusion (and no major therapeutic procedure) grew from 28 percent in 2000 to 34 percent in 2013. At the same time, the percentage of red blood cell transfusion stays with only a diagnostic procedure decreased from 14 percent in 2000 to 10 percent in 2013. In each year, about 19 percent of inpatient stays with a red blood cell transfusion involved no other procedure. Table 3 lists the 15 most frequent principal diagnoses among hospitalizations with a red blood cell transfusion as the sole procedure in 2013. Data on the same diagnoses also are provided for 2000 for comparison. Note: Table is sorted by the highest number of stays with a red blood cell transfusion as the sole procedure in 2013. Hereditary, nutritional, hemolytic, and bone marrow failure anemias was the most frequent principal diagnosis for stays with a red blood cell transfusion without another procedure in 2013. Hereditary, nutritional, hemolytic, and bone marrow failure anemias was the principal diagnosis for 75,585 stays with a red blood cell transfusion as the sole procedure in 2013, representing 39.2 percent of all stays for that condition and nearly 20 percent of the 391,100 stays with a red blood cell transfusion as the sole procedure (data not shown). Hereditary, nutritional, hemolytic, and bone marrow failure anemias was also the most frequent principal diagnosis for stays with a red blood cell transfusion without another procedure in 2000, with 39,269 stays. Diagnoses such as sickle cell anemia and urinary tract infections were top conditions for stays with a red blood cell transfusion as the sole procedure. These conditions did not appear in the top 15 conditions for all stays with a red blood cell transfusion. Sickle cell anemia was the principal diagnosis for 17,240 stays with a red blood cell transfusion as the sole procedure in 2013, more than double the number in 2000 (6,893 stays). Sickle cell anemia stays with a red blood cell transfusion as the sole procedure also doubled in percentage of stays for that condition (from 12.2 percent to 24.0 percent). Other conditions that were unique to patients who received only a red blood cell transfusion and no other procedure in 2013 included urinary tract infections (8,950 stays), fluid and electrolyte disorders (6,685 stays), chronic obstructive pulmonary disease (6,425 stays), and diseases of white blood cells (6,230 stays). In each year, about 40 percent of hospital inpatient stays with a red blood cell transfusion involved a major therapeutic procedure. Table 4 lists the 10 most common major therapeutic procedures in 2013 among hospitalizations with a red blood cell transfusion. Data on the same procedures also are provided for 2000 for comparison. Treatment of hip fracture or dislocation was the most frequent major therapeutic procedure among stays with a red blood cell transfusion in 2013. There were 91,835 procedures to treat a fracture or dislocation of the hip or femur that involved a red blood cell transfusion in 2013, with a substantial increase in the proportion of these procedures that involved a red blood cell transfusion (from 21.5 percent in 2000 to 33.9 percent in 2013). Hip replacement and knee arthroplasty were among the most frequent major therapeutic procedures with a red blood cell transfusion in 2013, each representing over 50,000 inpatient stays. Red blood cell transfusion occurred during 80,405 stays with hip replacement surgery and 56,460 stays with knee arthroplasty in 2013 but at substantially lower rates compared with treatment of hip fracture or dislocation (16.3 percent and 7.7 percent, respectively, vs. 33.9 percent). Both hip and knee replacement surgeries were among the most frequent major therapeutic procedures with a red blood cell transfusion in 2013. The proportion of these procedures that involved a red blood cell transfusion did not change substantially between 2000 and 2013. In 2013, approximately 34 percent of inpatient stays with a red blood cell transfusion involved another minor therapeutic procedure. Table 5 lists the 10 most common procedure categories for the minor therapeutic procedures in 2013 among hospitalizations with a red blood cell transfusion. Data on the same procedures also are provided for 2000 for comparison. The most frequent minor therapeutic procedure during inpatient hospital stays with a red blood cell transfusion in 2013 was respiratory intubation and mechanical ventilation. Red blood cell transfusion occurred during 150,440 stays with a respiratory intubation and mechanical ventilation procedure in 2013, up from 52,855 stays in 2000. The total number of stays in this procedure category (over 1.0 million in 2013) as well as the percentage of stays with a red blood cell transfusion (13.9 percent in 2013) increased from 2000 to 2013. Hemodialysis was among the most frequent minor therapeutic procedures with a red blood cell transfusion in 2013, representing over 115,000 inpatient stays. Hemodialysis was the second most frequent minor therapeutic procedure occurring with a red blood cell transfusion in 2013, involving 117,630 inpatient stays. Both the total number of stays in this procedure category and the percentage of stays with a red blood cell transfusion increased from 2000 to 2013. All differences noted in the text differ by at least 10 percent. All-listed procedures include all procedures performed during the hospital stay, whether for definitive treatment or for diagnostic or exploratory purposes. The first-listed procedure is the procedure that is listed first on the discharge record. Inpatient data define this as the principal procedure—the procedure that is performed for definitive treatment rather than for diagnostic or exploratory purposes (i.e., the procedure that was necessary to take care of a complication). The term procedure in this Statistical Brief included surgeries as well as minor procedures. ICD-9-CM is the International Classification of Diseases, Ninth Revision, Clinical Modification, which assigns numeric codes to diagnoses and procedures. There are approximately 14,000 ICD-9-CM diagnosis codes. There are approximately 4,000 ICD-9-CM procedure codes. The Procedure Classes provide users with an easy way to categorize procedure codes into one of four broad groups: minor diagnostic, minor therapeutic, major diagnostic, and major therapeutic.8 The Procedure Classes are based on the ICD-9-CM codes. For this Statistical Brief, the major and minor diagnostic procedure classes were combined into one category, diagnostic. Each inpatient stay with a red blood cell transfusion was categorized into a single Procedure Class using all-listed procedures (i.e., the principal procedure and up to 14 secondary procedures). The assignment was based on a hierarchy that first looked for the presence of a major therapeutic procedure, then a minor therapeutic procedure, then diagnostic procedures, and finally stays in which red blood cell transfusion was the sole procedure. CCS categorizes ICD-9-CM diagnosis codes and procedure codes into a manageable number of clinically meaningful categories.9 This clinical grouper makes it easier to quickly understand patterns of diagnoses and procedure use. CCS was used to define diagnosis conditions and procedure categories in Tables 2-5. Three categories of anemias from the CCS diagnosis categorization scheme are specifically defined below to clarify the different types of conditions included in each category. Hereditary, nutritional, hemolytic, and bone marrow failure anemias (CCS 59 Deficiency and other anemia) includes ICD-9-CM diagnosis codes: 280.0 280.1 280.8 280.9 281.0 281.1 281.2 281.3 281.4 281.8 281.9 282.0 282.1 282.2 282.3 282.4 282.40 282.43 282.44 282.45 282.46 282.47 282.49 282.7 282.8 282.9 283.0 283.1 283.10 283.11 283.19 283.2 283.9 284.0 284.01 284.09 284.1 284.11 284.12 284.19 284.2 284.8 284.81 284.89 284.9 285.0 285.21 285.22 285.29 285.8 285.9. Acute posthemorrhagic anemia (CCS 60) includes ICD-9-CM diagnosis code: 285.1. Sickle cell anemia (CCS 61) includes ICD-9-CM diagnosis codes: 282.41 282.42 282.5 282.60 282.61 282.62 282.63 282.64 282.68 282.69. The ICD-9-CM procedure code defining red blood cell transfusion is 99.04, Transfusion of packed cells. For the purposes of this Statistical Brief, we identify any stay with a red blood cell transfusion and do not distinguish the number of blood units used during each stay, which could be one or more than one. Annual costs were inflation adjusted using the Gross Domestic Product (GDP) Price Index from the U.S. Department of Commerce, Bureau of Economic Analysis (BEA), with 2013 as the index base.11 That is, all costs are expressed in 2013 dollars. Admission source (now known as the patient's point of origin) indicates where the patient was located prior to admission to the hospital. Emergency admission indicates that the patient was admitted to the hospital through the emergency department. The HCUP National (Nationwide) Inpatient Sample (NIS) is a national (nationwide) database of hospital inpatient stays. The NIS is nationally representative of all community hospitals (i.e., short-term, non-Federal, nonrehabilitation hospitals). The NIS includes all payers. It is drawn from a sampling frame that contains hospitals comprising more than 95 percent of all discharges in the United States. The vast size of the NIS allows the study of topics at the national and regional levels for specific subgroups of patients. In addition, NIS data are standardized across years to facilitate ease of use. Over time, the sampling frame for the NIS has changed; thus, the number of States contributing to the NIS varies from year to year. The NIS is intended for national estimates only; no State-level estimates can be produced. For other information on specific procedures and treatments, including red blood cell transfusions, refer to the HCUP Statistical Briefs located at http://www.hcup-us.ahrq.gov/reports/statbriefs/sb_specific.jsp. West KA (National Institutes of Health), Barrett ML (M.L. Barrett, Inc.), Moore BJ (Truven Health Analytics), Miller JL (National Institutes of Health), Steiner CA (Agency for Healthcare Research and Quality). 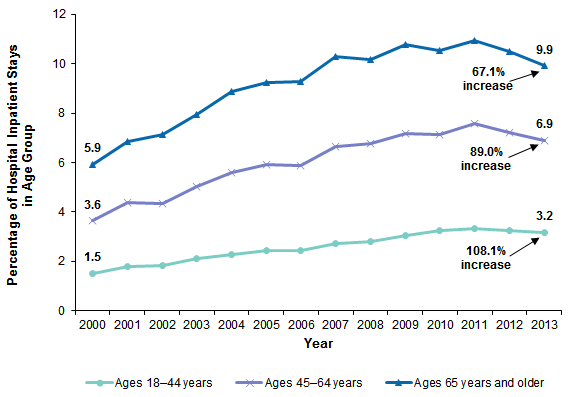 Trends in Hospitalizations With a Red Blood Cell Transfusion, 2000-2013. HCUP Statistical Brief #215. December 2016. Agency for Healthcare Research and Quality, Rockville, MD. http://www.hcup-us.ahrq.gov/reports/statbriefs/sb215-Red-Blood-Cell-Transfusions.pdf. This Statistical Brief was posted online on December 1, 2016. 1 U.S. Department of Health & Human Services, National Institutes of Health, National Heart, Lung, and Blood Institute. What Is a Blood Transfusion? https://www.nhlbi.nih.gov/health/health-topics/topics/bt. Accessed July 21, 2016. 2 Carson JL, Grossman BJ, Kleinman S, Tinmouth AT, Marques MB, Fung MK, et al. Red blood cell transfusion: a clinical practice guideline from the AABB. Annals of Internal Medicine. 2012;157:49-58. 5 Pathak R, Bhatt VR, Karmacharya P, Aryal MR, Alweis R. Trends in blood-product transfusion among inpatients in the United States from 2002 to 2011: data from the Nationwide Inpatient Sample. Journal of Hospital Medicine. 2014;9:800-1. 7 Barrett M, Hickey K, Coffey R, Levit K. Population Denominator Data for Use with the HCUP Databases (Updated with 2014 Population Data). HCUP Methods Series Report #2015-07. September 1, 2015. Rockville, MD: Agency for Healthcare Research and Quality. http://www.hcup-us.ahrq.gov/reports/methods/2015-07.pdf. Accessed February 17, 2016. 8 Agency for Healthcare Research and Quality. Procedure Classes 2015. Healthcare Cost and Utilization Project (HCUP). Rockville, MD: Agency for Healthcare Research and Quality. Updated February 2016. http://hcup-us.ahrq.gov/toolssoftware/procedure/procedure.jsp. Accessed June 8, 2016. 9 Agency for Healthcare Research and Quality. HCUP Clinical Classifications Software (CCS) for ICD-9-CM. Healthcare Cost and Utilization Project (HCUP). Rockville, MD: Agency for Healthcare Research and Quality. Updated October 2016. http://www.hcup-us.ahrq.gov/toolssoftware/ccs/ccs.jsp. Accessed October 27, 2016. 10 Agency for Healthcare Research and Quality. HCUP Cost-to-Charge Ratio (CCR) Files. Healthcare Cost and Utilization Project (HCUP). 2001-2013. Rockville, MD: Agency for Healthcare Research and Quality. Updated November 2015. http://www.hcup-us.ahrq.gov/db/state/costtocharge.jsp. Accessed February 17, 2016. 11 U.S. Bureau of Economic Analysis. National Income and Product Account Tables, Table 1.1.4 Price Indexes for Gross Domestic Product. http://www.bea.gov/iTable/iTable.cfm?ReqID=9&step=1#reqid=9&step=1&isuri=1. Accessed June 30, 2016. Internet Citation: Statistical Brief #215. Healthcare Cost and Utilization Project (HCUP). November 2016. Agency for Healthcare Research and Quality, Rockville, MD. www.hcup-us.ahrq.gov/reports/statbriefs/sb215-Red-Blood-Cell-Transfusions-Trends.jsp.